The L.A. Kings' first Stanley Cup in franchise history meant a lot to many long-suffering fans that feared they might never see the team raise the Cup before they die. But there were some that weren't so lucky. 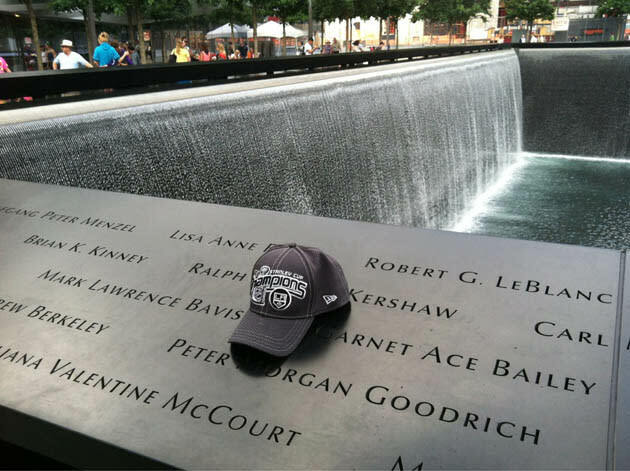 Two in particular: Garnet "Ace" Bailey and Mark Lawrence Bavis, L.A. Kings scouts who were aboard United Flight 175, which crashed into the South Tower of the World Trade Center on September 11, 2001. Both men are commemorated at the 9/11 Memorial at Ground Zero. Their names are written at the South Pool, on Panel S-3. That's a photo of the spot above, with an L.A. Kings Stanley Cup champions hat resting between them. Kings fan Dave Krasne, who lives in New York City, thought of the two scouts when the Kings won the Cup, and decided it wasn't right that they miss Thursday's Stanley Cup celebrations. He brought a hat to the memorial and laid it between them. "May Mark Bavis and Ace Bailey finally RIP," he said in a tweet. To Mr. Krasne, a hearty "Well Done!" sir. You took a step very few would have thought to take, and for that you deserve the praise of the entire hockey world. Thank you for keeping these men in your thoughts as you celebrated your team's championship. Ditto. Now, if you'll pardon me, things just got a little glassy in here.